These photos show a digital clock continuing to run as damaged circuits instantaneously heal themselves, rerouting electrical signals without interruption. Photos: Nature Materials. Many natural organisms have the ability to repair themselves. Now, manufactured machines will be able to mimic this property. As reported in a paper in Nature Materials, researchers at Carnegie Mellon University have created a self-healing material that spontaneously repairs itself under extreme mechanical damage. This soft-matter composite material is composed of liquid metal droplets suspended in a soft elastomer. When damaged, the droplets rupture to form new connections with neighboring droplets and re-route electrical signals without interruption. Circuits produced with conductive traces of this material remain fully and continuously operational when severed, punctured or have material removed. Applications for this material include bio-inspired robotics, human-machine interaction and wearable computing. Because the material also exhibits high electrical conductivity that does not change when stretched, it is also ideal for use in power and data transmission. 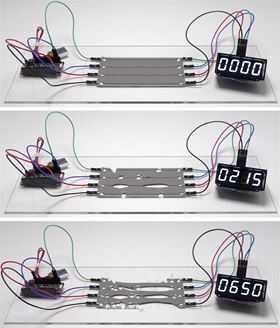 "Other research in soft electronics has resulted in materials that are elastic and deformable, but still vulnerable to mechanical damage that causes immediate electrical failure," said Carmel Majidi, an associate professor of mechanical engineering at Carnegie Mellon University. "The unprecedented level of functionality of our self-healing material can enable soft-matter electronics and machines to exhibit the extraordinary resilience of soft biological tissue and organisms." Majidi, who directs the Integrated Soft Materials Laboratory, is a pioneer in developing new classes of materials in the fields of soft matter engineering and soft robotics. "If we want to build machines that are more compatible with the human body and the natural environment, we have to start with new types of materials," he said. This story is adapted from material from Carnegie Mellon University, with editorial changes made by Materials Today. The views expressed in this article do not necessarily represent those of Elsevier. Link to original source. By combining physical and chemical approaches to self-healing, a new polymeric material can self-heal in semi-dry conditions. A polymer gel that incorporates chloroplasts from plants can react with carbon dioxide in the air to grow, strengthen and even repair itself.